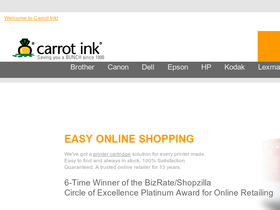 For premium ink and toner cartridges, go to Carrot Ink, online at carrotink.com. Carrot Ink offers an extensive selection of printer cartridges, ink cartridges, laser toner, ink refill kits, and fax film, as well as many other printer supplies. Carrot Ink is a trusted source for printer supplies compatible with Brother, Kodak, Xerox, Canon, Epson, HP, Dell, Lexmark, and Samsung, and offers top-notch products for much less than the price of printer manufacturers. So shop and save, and be sure to get all the latest CarrotInk.com discounts, Carrot Ink promotions, and Carrot Ink coupon codes found here at RetailSteal.com. Carrot Ink ships within the United States, US territories, and US military / diplomatic addresses. Carrot Ink offers standard shipping, FedEx 2-Day, and FedEx Standard Overnight. See site for more information. Save 20% from Carrot Ink on inks, laser toners, and more for Brother, Epson, Canon, and others. Plus enjoy free shipping. Click here and use coupon code on purchases $50+. Enjoy 10% savings and free shipping from Carrot Ink. Click here to shop and use coupon code on purchases $45 or more. Enjoy free shipping on any order of $30 or more from Carrot Ink. Click here and use coupon code to save. Enjoy a 10% discount from Carrot Ink. Save on inks for Kodak, Canon, Dell, HP, and more. Click here to activate offer and save on purchases of $30 or more. Save 15% from Carrot Ink and enjoy free shipping on your purchase when signing up for their email subscription. $30 minimum spend for discount. Save $10 on your purchase from Carrot Ink. Click here to activate savings with a purchase $50+. Save up to 75% on ink and laser toner purchases from Carrot Ink. Click here to save on inks for Brother, Lexmark, HP, Samsung, and more. Enjoy free shipping from Carrot Ink. Click here to save with purchases $40+.